The chipmunk who lives under our porch has awakened from his winter nap. The other day when I went out the back door, he'd been sitting on the step, and I startled him. He dashed into the garage, which is his new favorite place, I think. I have a barrel of black sunflower bird seed in there, and there are a whole lot of shelled seeds on top of the pile now! This is the first chippy I've made in a bit. I'd been out of chestnut fiber, which I need for his head. I got some alpaca from a seller on Etsy (Chimera is her shop name, if you want to get some, too) and now I'm set for chipmunks and a bunch of different birds. 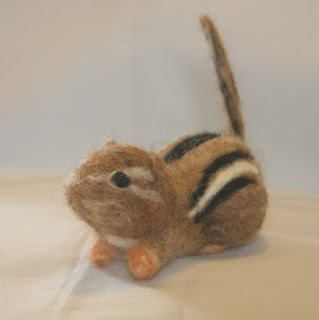 It reminds me of the chipmunk that sat on your shoe when you went hiking with Dad.